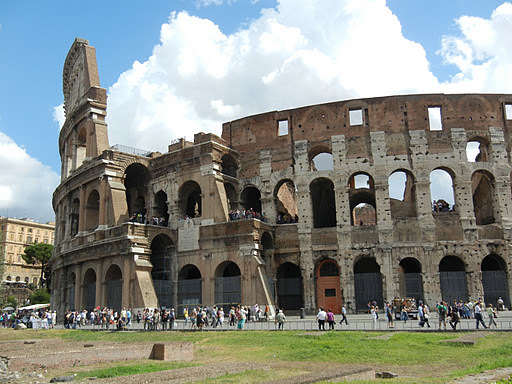 On my first full day in Rome, I visited the Colosseum. 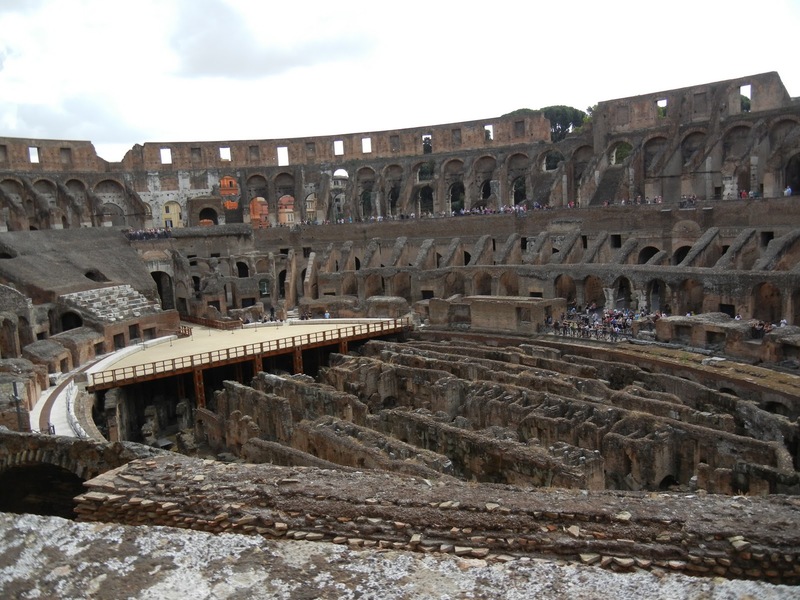 It’s a huge outdoor amphitheater where gladiators fought and people gathered for events like executions and dramas. It’s massive. I took some notes on how this public forum was used as an execution site by pitting a gladiator against a prisoner. I noted that seating in the Colosseum depended on class. I even stood in awe of the underground walkways that date back to the the late 70s. Not the 1970s but 70 A.D. But looking back on my pictures and my notes from that day, what strikes me most is the reference in my notes about the phrase “all roads lead to Rome.” Apparently, the Romans paved miles and miles of road all stemming from the center point of Rome. It’s not clear from my notes whether the Colosseum was the center point. I think that’s what our guide was saying, but I’m not sure. What I’m clear on is that somewhere in Rome was the equivalent of a 0 km marker, and all roads spanned out from there and led back to that point. This image of all roads leading to Rome has been on my mind lately. It’s comforting to think that you could have been on those roads and just turned around and found your way back to Rome. I wish we could navigate so easily today. Where is my Rome? What is my Rome? Am I on a path to it or away from it or am I nowhere near it at all? I sometimes want fewer choices than I have. I want to know how I am supposed to be spending my time. Who or what deserves my attention? Am I pursuing the right things? I want the path to center to be more clear. I want at least to know that I’m on it. This issue hit home with me today during my Toastmasters meeting. The theme today was alter egos. We talked about Superman and Clark Kent and such characters. I know it was meant to be lighthearted, but it sent me into a headspin or perhaps a tailspin. I thought about who I’d want to be if I could be anyone, and I realized that I’ve spent far too many years wanting to be someone else. In elementary school, I wanted to be Dacia. Aside from being smart and kind, she could do back handsprings all the way across the gym floor, whereas I couldn’t even manage a back walkover. In middle school, I wanted to be Kate because she had this gorgeous curly hair and could write and dance. I felt awkward and not cute, and I spent more time talking to boys about her than anything else. In high school, I still wanted to be Dacia and Kate, but when I went to boarding school, then I wanted to be Kishie and Karyn too. Kishie could sing so beautifully, and she had the most laid back and gentle spirit about her. I’d never met anyone like her. And Karyn had the determination of a real athlete and the scars to prove it. I watched her swim and envied her grace in the water. I watched her in the minutes and sometimes hours before her race and envied her focus on the task at hand. And outside of the pool, she struck me as both strong and accessible. She taught me to journal and opened my world up to music I had never heard. I can still see us listening to the Alarm’sSpirit of ’76 and watching her gesture the act of carving out a future with her two bare hands. What a song. Karyn introduced me to it. I wanted to be her. Even today, I want to be Dacia, Kate, Kishie, Karyn and a number of other women I’ve met along the way. I love these women, and I love the lives they have built – the families they have built. They have marriages and children and jobs they love and do well. I know we all struggle in our own ways, but I feel like they’re in Rome, and I’m out on some random road wondering which direction Rome is and whether I even belong there. At some point, I need to get comfortable with just being Taline. And at some point I need to believe that “just” doesn’t belong in that sentence. It’s hard though. I’ve had nearly thirty-eight years of practice at wanting to be someone else. It’ll take me time to break that habit. Maybe lots of time. All roads lead to Rome, huh? Maybe. But I guess I need to remember also that Rome wasn’t built in a day. Great post! Now you're getting to the truth. I've heard you say you wish you were more like "X" and thought, that's a shame. You are wonderful and perfectly complete in your own right!So, what if "Rome" is actually on the inside? What if you're already on the right path as long as you're asking these questions and thinking about being yourself? What if Rome is a place at the center of you?? ?